It's been such a long time since I have given a garden update. I don't have piccies of the garden itself as I thought you might prefer to see what is coming out of our garden.The basket is what I picked this morning. I am probably getting this many yellow tomatoes & beans every day but the larger tomatoes including the 3 black russians in the top photo are only being picked every 2nd day, the cucumber have only just started fruiting again. The spring onions are getting huge and we only pick them as we need them, but we want to clear that space this week so we can prepare half of the onion bed for the broad beans to go in. The zucchinis are not doing to well so we have planted more and we have 2 watermelons ripening - we are very excited about them. 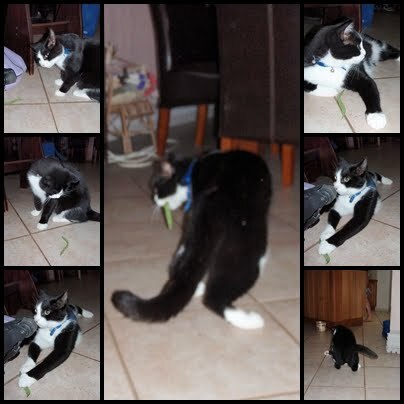 Even Feeny is excited about our vegies, he spent a good half hour last night pushing a green bean around the family room. May I have a 'goodie bag' of veggies? Chuckle! They look fabulous, Gail! Lovely garden goodies there, Gail. 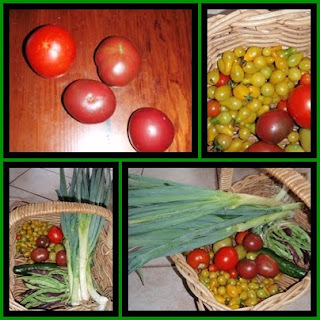 It is so satisfying to go and pick something fresh like that. Your spring onions certainly are big! Lovely lot of veggies from your garden. I think cats and beans always seem to go together. I remember when I was much younger our cat at home used to meow so much when Mum was cutting up the beans. The vegies look great. We have had some great beans. All from Mum's garden that is where Buck does his veggies. Yours reminds me of what Dad picked when I was a child.